This last week my wife Fiona and I were vacationing in England, and we reserved time at the end of our trip to visit two hotspots we’d seen mentioned online. The first one was The Way Out Club, said to be England’s largest transgender and crossdressing club in the country (some say Europe). 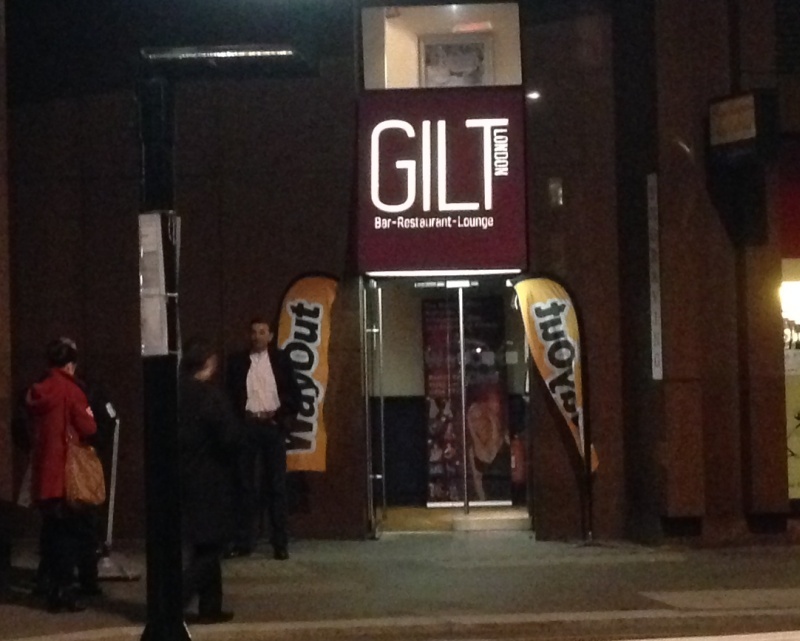 The Club does not have a fixed location, and meets at two other nightclubs – the night we attended, it was at the Gilt Bar; other nights it meets at the Yager Bar. The Club as such only meets on Saturday nights, so you can call it a moving transgender party rather than an actual nightclub. We arrived early due to schedule issues, and found a clean and well-laid out place with a very friendly staff who seemed like they were happy to have us there. Drinks were reasonably priced (for London) and the dance floor reasonable (again, for London…in England, everything, including club venues, are typically much smaller than the United States). The music was techno-dance, which was reasonably danceable. What she was referring to was the chasers, who unfortunately still outnumbered the actual t-girls by nearly 2:1 by the time we left. The situation may be different if you stay later, but remember, in London you can’t really stay much past midnight without needing an extremely expensive taxi or dodgy bus ride, as the tube stations mostly shut before 12:30. The second place we called at was The Candy Bar, which bills itself as a lesbian club which is welcoming to transgender persons (and men). The Candy Bar is a permanent club, and it is run very differently from the Way Out Club. Candy is noisy, very crowded despite having three floors, and hosts a much younger crowd than the Way Out Club. Upstairs are a few chairs and couches to sit on, which were always filled with girls chatting or making out. Ground floor is the bar, which is a bit pricey even for London, and downstairs is the dance floor and toilets – but to get downstairs, you have to turn over your handbag and coat to a check facility, which charges you a pound an item to take them. This was said to be due to “fire regulations” but it was apparently applied at random, as club regulars could take their bags downstairs. The staff seemed indifferent overall, and even though we were supposed to get half-price admittance, due to a “technicality” we had to pay full price. The music the night we were there was London hip-hop, which we only danced a little to. There were also an annoying number of men there, some who seemed to be doing little more than ogling the girls making out and dancing together. I’ve read on their website that Candy Bar will be moving next year due to a rent increase, so it may also change its style as well. Between the two, if you are in London, I recommend trying Way Out – just plan to stay late and arrange transport. I’d happily return there. 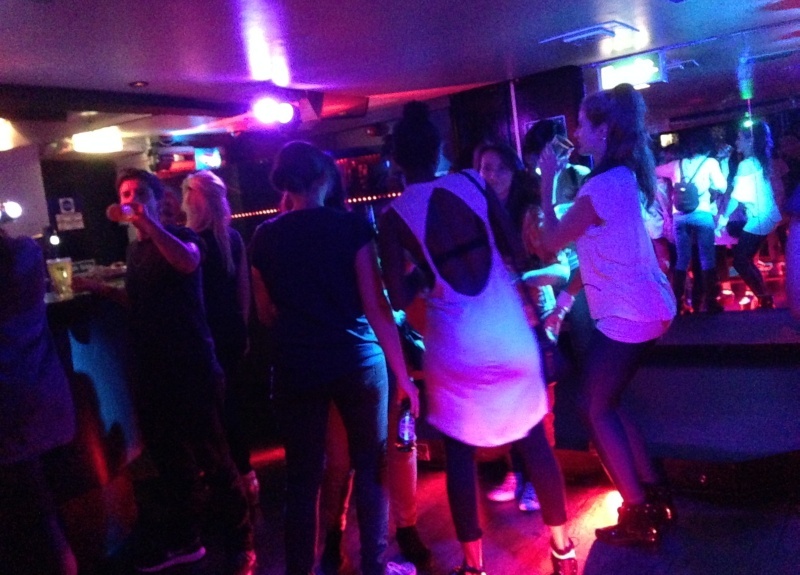 This entry was posted in Entertainment and tagged london, nightclubs, united kingdom on October 27, 2013 by .